My apprenticeship experience will always be near and dear to my heart. In one season I learned so much about growing organic food and small-scale farming. It was such a great opportunity to learn all about organic farming in a place as beautiful as Sooke. First I will evaluate my experience as an apprentice. My experience was positive, yet was also at times emotionally and physically challenging. I felt welcomed by my hosts throughout the time I lived and worked with them. During the apprenticeship I learned in a variety of ways. I learned hands-on by doing a wide variety of tasks. Each morning I began by giving water to the chickens and then leading them into the orchard with a pail of grain. Then I moved the attachable sections of irrigation pipes in the orchard and moved the sprinklers in the pastures. In the evening I also did these chores. Being responsible for these two aspects of the farm gave me a sense of being a part of the healthy functioning of the farm. It also gave me a routine so that I knew what start with, and how to end each day. I enjoyed learning about the chickens by being with them so often and also through asking questions to George and Anna when they arose. I also had the special chance to help care for chicks (although the hen who hatched them did most of the work). Through the season I helped with most tasks on the farm. My host explained most tasks in detail to me. I also had many chances to learn by myself by observing the best way to do something. In learning to drive the tractor my host explained all of its functions, but I really learned through opportunities to practice driving. I tried to compliment my hands on learning through asking questions to my hosts, and through reading and taking notes. Often George, one of my host farmers, would speak at length to answer a question, or simply in conversation. It was very good to hear him speak and to learn from this. My hosts have a milking cow and George believes that having milk and other benefits from a dairy cow is important to his family. He lent me two books about caring for a dairy cow and about milk. I feel that having this balance helped me to take in my experience and explore what I was learning more thoroughly. I kept a journal in which I wrote about what I had done and seen that was special for me, and also about what I found challenging. The experience of being immersed in farming for a season allowed me to be part of most aspects of the farm. I was able to make a connection with my hosts and to help them in a meaningful way. I had an opportunity to see how much work is involved in having a farm and orchard. I also realized that by working steadily it is possible to do some tasks each day (such as caring for animals), and others as the season progresses (such as harvesting different kinds of fruit). Moreover, I received knowledge and gained skills that I will be able to use in many situations in my life. I thought of mentioning privacy as one potential issue in an apprenticeship. At my host farm I slept in a small cabin, and cooked in a comfortable outdoor kitchen. I think that for me and for my hosts, it was important to have personal space. First, I think that farming can be intense at times, and everyone needs space to do what is personal to them. My hosts mentioned that they had tried to host the apprentice in the house but that conflicts arose. Also, I appreciated very much some shared meals that we ate together outside. These meals were a chance for everyone to feel that they could come to know aspects of each-others personal lives. So much time is shared working, and it feels good to sit and to celebrate together as well. I think that I will have more confidence if I do enter into some farming endeavor. In a way I realized during my apprenticeship (and George spoke about this) that one can learn new things through doing them. I gained many practical skills and a sense of confidence in working with my hands. I also learned more about eating well, and about working steadily. I think I understand more about what a farm or a land can mean to the people who live there. My hosts' farm is very important to them. In the future I will be able to respect other peoples lives and work on their land. I hope to have a relationship with growing food and to be a land steward, wherever I go in life. 2015 SOIL apprentices Lana and Aaron just sent this link along. They're blogging about their SOIL apprenticeship. Great stuff you two! Farm Folk/City Folk is seeking a couple of interns for help with a seed security initiative. A $2000 stipend is offered. Details within. 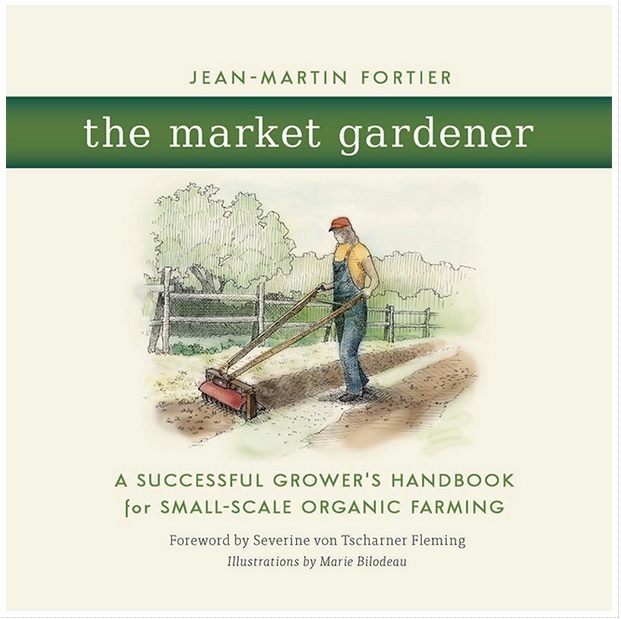 SOIL Apprentices and Host Farmers alike will enjoy this interview with Jean-Martin Fortier, author of the forthcoming english translation of The Market Gardener, in which Jean-Martin explains how he and his wife gross $140,000 in veggies sales on just 1.5 acres. Welcome to SOIL's new website!